For the last in this series of summer activities we’re looking at games. Not the kind of games you see on a screen, old fashioned games you can play around the kitchen table with just a few simple items or a little imagination! Great for all the family to join in and also good for wet weather days or even when off camping or in the car. Lots of table top games involve being able to memorise things but you can make them as simple or difficult as you want. One of the simplest is to put a selection of everyday objects on a tray, ask players to look at them and memorise what they see. Ask them to turn around/close their eyes and remove an object. They then have to guess which object is missing. Make it trickier by moving the objects around each time you remove one. Alternatively you can just ask them to try and remember all the items and see how many they manage. This is where you have a number of cards made up of pairs of images. You lay them all out, face down, and players can turn them over – first one and then another. The object of the game is to find all the pairs. Because they can only turn two at a time they have to remember where they were in order to find the pair to the card they turned first. 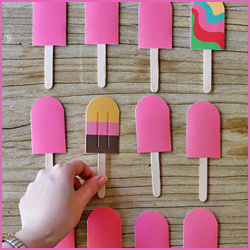 You can download these cards online for free including this really cute ice lolly one. Standard Hide & Seek – one person counts and all others go hide. They simply go round and find everyone and the last one to remain hidden wins. Hiders can move hiding places throughout if they want to. Hide & Seek with Base – in this version you assign a ‘base’ – a safe area where hiders can return to if they can do so without the seeker tagging them. Once back at base you can no longer be tagged. Hide & Seek with Base and Time Limit – in this version you set a time limit of, for example, 5 minutes. All hiders have to try and make their way back to base without being tagged by the end of this time limit. You can set a kitchen timer and call out a ‘time update’ every minute to make it more exciting. Hide & Seek with One Hider – this time only one person hides and all the others seek. However, whenever anyone finds the hiding, they too have to hide there with them until you end up with lots of people all hiding squished into one hiding place! Jailbreak – in this version you assign a ‘jail’ area. Each person who gets found is put in jail. However, untagged people can break them out if they get to them without being tagged! Hopefully these different versions can keep even the most jaded hide and seeker entertained! We hope that you’ve enjoyed this series of blog; we’ve really enjoyed researching and writing them! Next week the kids will be back at school and some normality will return. Hopefully, they’ll go back to tell their friends about the fun things they got up to at home over the summer! To have a look back at the whole series then click here and don’t forget, you can still win a £25 toy voucher just by sharing your ideas and experiences with us on Facebook. 0 Responses to "The Summer Kitchen Activity Guide Part 6: Fun & Games"